The Plaza Mayor is located in the old center of Segovia, Spain. The shady Plaza Mayor is the nerve centre of old Segovia, lined by an eclectic assortment of buildings, arcades and cafés and an open pavilion in its centre. 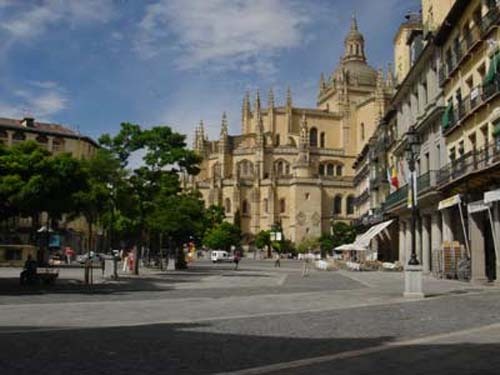 It’s also the site of the catedral and the tourist office. The road connecting Plaza Mayor and the aqueduct is a pedestrian thoroughfare that locals know simply as Calle Real. 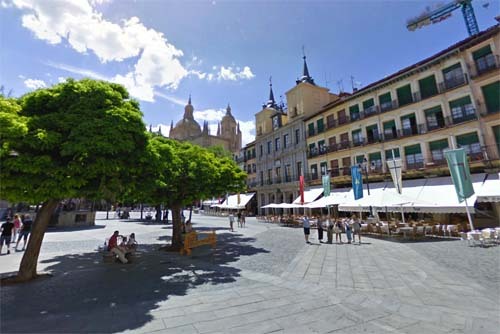 At the Plaza Mayor in Segovia, you will find the Cathedral of Segovia. Begun in the 16th century but not finished until 1768, Segovia Cathedral is the last Gothic cathedral to be built in Spain. Fronting the historic Plaza Mayor in Segovia, it stands on the spot where Isabella I was proclaimed Queen of Castile. Affectionately called la dama de las catedrales, Segovia Cathedral has a supremely Gothic exterior combined with a surprisingly bare interior, but contains numerous treasures. 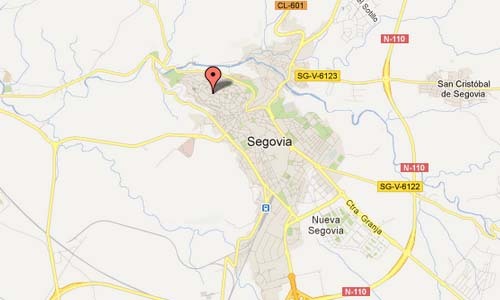 Segovia is located within the Iberian Peninsula, near Valladolid and the Spanish capital, Madrid. In 1985 the old city of Segovia and its Aqueduct were declared World Heritage by UNESCO. Within the environment of the old city, stand diversity of historic buildings both civil and religious, not just catholics but also Jews, like the district that served this minority, which commemorates the different cultures in the city. One of the best examples of this cultural diversity is represented by the former synagogue, now the church of Corpus, and the Jewish cemetery located in “El Pinarillo” with its interpretation center in the most important Jewish palace of the Spanish aljamas, the chief accountant Meir Melamed, son-in-law and successor of Abraham Senior, chief rabbi of the Kingdom of Castile, Melamed after converting to Christianity under the name of Fernán Núñez Coronel, was alderman of the city and occupied important positions in the kingdom. More information on www.sacred-destinations.com and en.wikipedia.org.